Artist Eric Garcia uses his unconventional art to inform and educate others. As soon as his pen hits paper, professional artist Eric Garcia’s mind is buzzing with new ideas for his next piece of art. Incorporating an unconventional style in his work, he tells stories about social and political issues in the world through his art. Garcia specializes in hand-printed posters, political cartoons and large scale public murals to educate and challenge. Recently, Garcia came to RMHS for the third time to instruct Art 1 students on relief printmaking. Demonstrating how to properly create prints, he mentored the kids on their own pieces as well. Using his work to teach the students, he showed how to add meaning to art to create conversation. Garcia showed possible materials to carve into and different styles of printmaking. Showing his art in several different local and international exhibits, Garcia has received numerous recognitions and awards including the Jacob Javits fellowship, the Midwestern Vision and Voices fellowship and the Associated Press Student award for political cartoons. 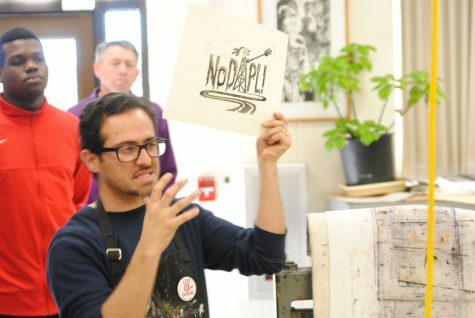 “He is excellent at explaining how to create a message with your art and exemplifies how printmaking is historically and currently a dynamic way to communicate to many people all at once,” art teacher Martha Nava said. Garcia has also done several presentations to educate others about the artistic profession. He has taught at DePaul University, University of Illinois at Chicago, The Art Institute of Chicago and Ohio State University. Mixing history and Latin culture with modern themes, he uses his work to create and educate. He believes that every student should be exposed to many forms of art. “It’s important to give students a variety of art styles and techniques, so they can find the one that best fits their interest,” Garcia said. In the future, he hopes to paint a mural at the Hyde Park Art Center and give lectures about his political cartoons at the National Museum of Mexican Art. Garcia wants to continue spreading messages through his vision of art.